MOBILE FOMAR APPLICATION AVAILABLE FOR ALL PLATFORMS! 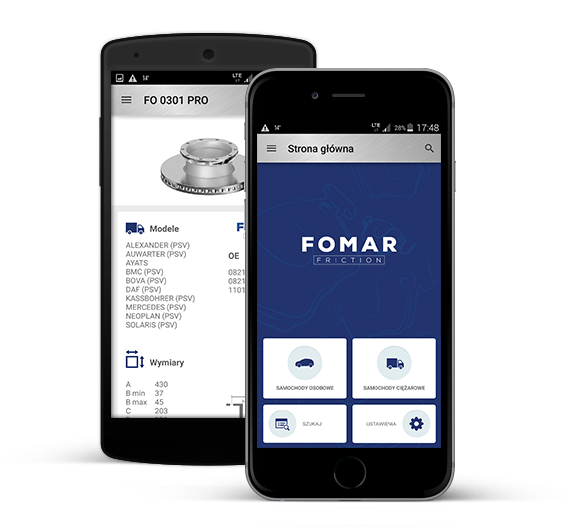 The application contains the catalogues of the FOMAR company products, and allows to browse them in an advanced mode. The user will be able to become familiar both with the FOMAR company products for cars and for trucks. The database contains catalogues of brake pads, discs and linings. With our mobile device application, you can have convenient access to our current product catalogues wherever you are. The application contains all the necessary information on our products, such as: technical drawings, dimensions, catalogue numbers or models of vehicles in which they are installed. Our advanced search engine will quickly select the suitable parts for your car.